In most mammals the corpus luteum (CL) remains functional for a period related to the length of the estral cycle. In the absence of the luteotrophic signal, the CL undergoes spontaneous loss of cell function (functional luteolysis) and structural regression (structural luteolysis), allowing the development of a new ovulatory cycle. Apoptosis occurs during spontaneous and experimental CL regression. 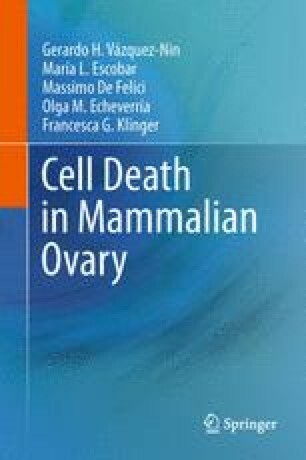 Ovaries ­collected from caspase-3 deficient mice retained many corpora lutea at any point of time recorded post ovulation. In the marmoset, a primate, the CL showed numerous features of autophagic cell death as vacuolated cytoplasm, vacuoles ­containing cytoplasmic debris, and autophagosomes. On the other hand, typical morphological features were absent. These observations suggest that luteolytic cell death might be a combination of apoptosis and autophagy. The vasculature is an important regulator of CL functions. The capillaries disappear earlier than the large vessels during structural luteolysis. The endocrine mechanisms of the cyclical regression of the CL are slightly different in primates and other mammals. Physiological levels progesterone produced in the corpus luteum protect cells against death. The decline in progesterone preceding structural luteolysis is a prerequisite for initiation of apoptosis induced by tumor necrosis factor alpha (TNFα) involved in apoptotic cell death activation, affecting primarily endothelial cells. Numerous findings suggest that progesterone has a role in regulating luteal and endothelial cell function in bovine corpus luteum, especially at the early luteal stage as autocrine/paracrine regulator. Terminal Deoxy-UTP nick end labeling. Procedure that detects DNA breaks typical of apoptosis.